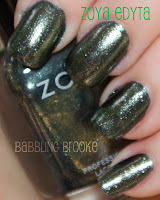 I am so excited about the new Zoya Wicked collection because it is loaded with glitter and shimmer. I was really impressed with how easily these polishes covered - most of them were one-coaters. Wicked is one of the two new collections released by Zoya for Fall; Wicked is full of metallic shimmers and Wonderful, Zoya's matching fall collection, is composed of 6 creme polishes. Like all Zoya polishes, Wicked is vegan (never tested on animals and containing no animal ingredients) and completely free of toluene, camphor, formaldehyde, and DBP - chemicals that are known to cause cancer and birth defects. Zoya polishes are safe for pregnant mothers and those with allergies to the harmful ingredients found in some other polishes. All pictured can be expanded just by clicking on them! Edyta is a really pretty, unique green with lots and lots of gold and blue shimmer. I was surprised by this one and really like how original it is. I also thought it looked really nice with my skintone, which many greens do not. This color feels very fall to me - I'm glad they introduced this in the fall line. Julieanne has a very dark purple (or perhaps even black) base and is LOADED with purple glitter. This polish is my absolute favorite and it is a BEAUTIFUL color. I can't express how much I love this one - which surprised me, since purple is normally just, well, purple. This is just so beautiful, so full of shimmer, and stunning in the sunlight. It covered with one coat and dried pretty fast. Cheryl is a very dark polish (dark brown I think) with TONS of bronze glitter. The color is mainly compromised of the bronze glitter, but the dark base shows through in a really cool, unique way. Cheryl covered pretty well with one coat, but I used two for really excellent coverage. This is a stunning bronze that is ideal for summer and fall - I love it. 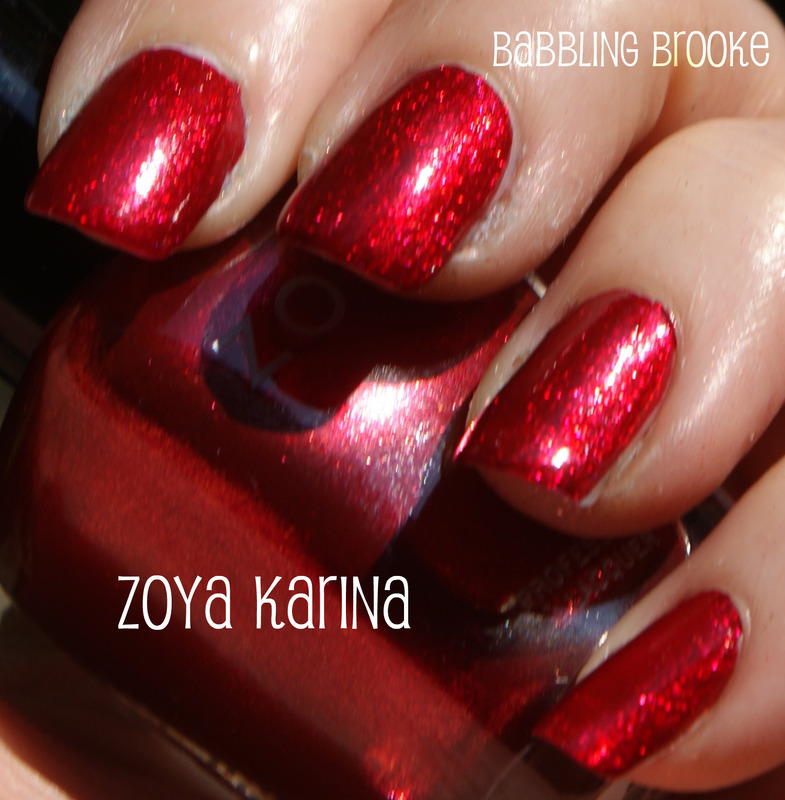 Karina is a magenta-y bright red with tons of shimmer. It sort of reminds me of Ruby Pumps, but the shimmer is finer and Karina is darker. Karina also only took one coat (amazing! ), covered nicely, and dried quickly. I really like this one. Carrie Ann is more orange-based than Karina, and she shimmer is much finer. 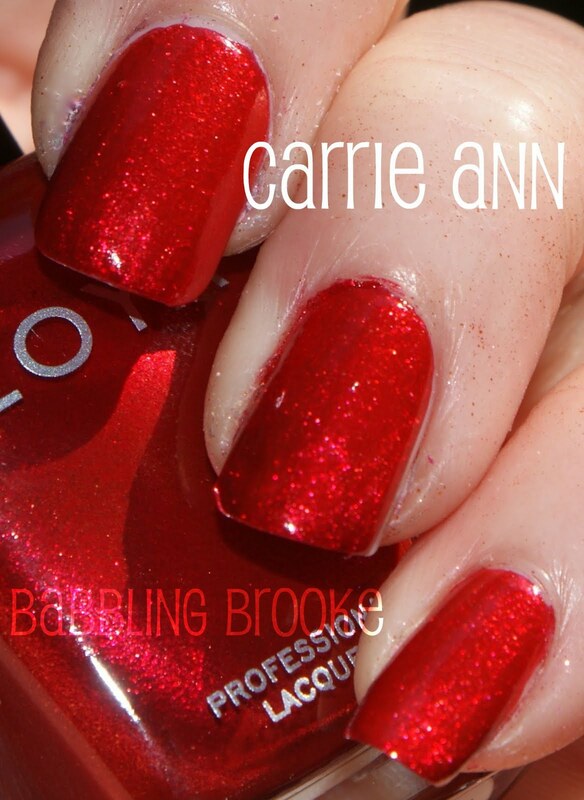 Carrie Ann also had a thinner formula than the other five polishes and took two coats (which is still really good). Carrie Ann is a very pretty color, but I prefer Karina with my skin tone. Kym is an extremely glittery brownish medium-dark red. It covered nicely with one coat, until two made it look smoother and even more glittery. Kym is so totally "fall" to me. Really pretty. Learn more about Zoya Wicked HERE. 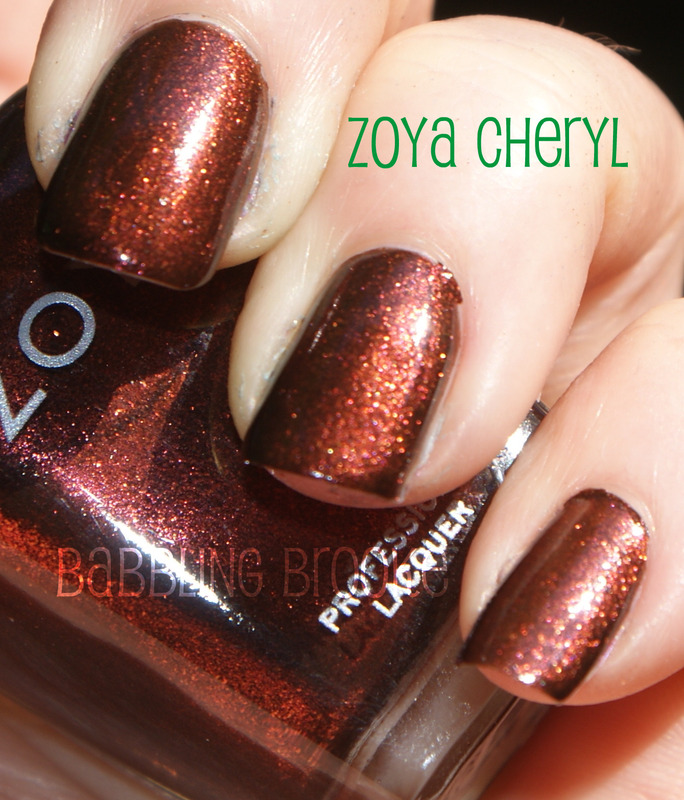 Thanks for checking out Zoya's new Fall collection, Wicked. All Zoya Wicked shades are available now at Zoya.com!! Featured products provided by company/PR for review purposes. I think Karina, Carrie Ann, and Cheryl are my favorites. They are all beautiful though! Julieanne, Kym, and Cheryl. HOT! But why did they make so many reds? Great collection!! That purple is gorgeous! I'm glad this brand doesn't test on animals! It's hard finding nail polish and such that doesn't! I kept buying OPI for so long cause that was all I knew that didn't test on animals and it lasted a week for me. Julieanne is beautiful. I don't have anything like that. Julieanne and Edyta looks gorgeous! I adore the sparkley green and purple, although I already own Mimi and would be afraid that Julieanne would be too much like it! Ahhh, I just noticed that they're named after the professional dancers from dancing with the stars! cute, haha! Brooke, I was not interested in these in the least until I read your lovely descriptions! one coat glitter? yes please! EDIT: oh no, DWTS? i might have to skip them after all! Nice swatches! I'm into Edyta and...maybe Kym (looked gorgeous on you). Brooke, I was wondering if maybe you had a suggestion on some kind of base coat I could use for my nails, I got ENVY by OPI for brittal/peeling nails and it seemed to be doing fine but today one just peeled off! It's really annoying and it will peel back way to far into my nail. Do you have any suggestions for this? Thank you all so much for your kind comments!! Jess, I too look for products that are never tested on animals - that's a huge reason I love Zoya so much :) ALL companies should be cruelty-free - and it is really nice finding companies that adopt such ethical standards. I buy Zoya at Zoya.com - I have never seen it at a store, but I know they are available at some stores. Zoya.com has a lot of great sales, periodically - sign up for their mailing list and try a few out at the next sale! Caitlin, I didn't even realize that!! I was wondering if maybe they were all named after people the 'namers' disliked (Wicked people? haha). Jessica G., I would really highly suggest Seche Rebuild or Essie Billionails - although I'd lean towards Rebuild. I have been using Rebuild for the last month and a half or so and it has REALLY, REALLY strengthened my nails. They are so much longer than they were before, and much less prone to breaking. Let me know if you try Rebuild - I really think you'll love it! I love Edyta. The others are alright, I think I prefer the Wonderful set though.